Sometimes you might have to deal with small sites that aren’t CMS-based. Let’s take we have a plain HTML list of pages (we suppose the site is quite old and we don’t want to change its structure. 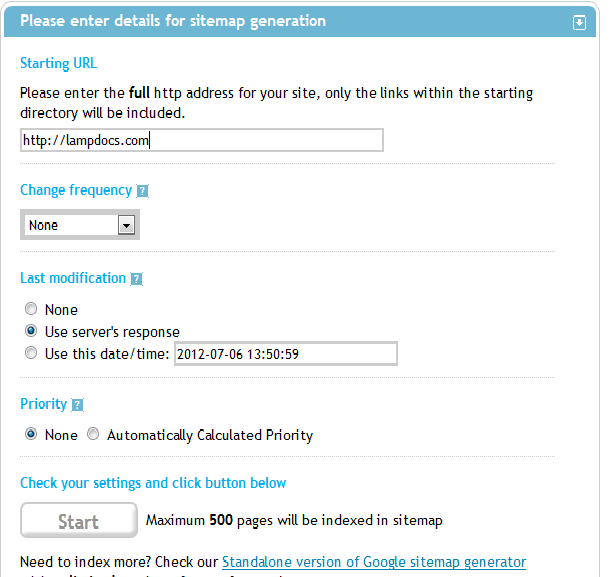 In order to let Google learn about this site and all its pages, we need to submit a sitemap to Google Webmaster Tools. All you need is to input your site URL in the field and select other 3 fields. If you’re a beginner, I recommend you just to input the site URL and leave all other fields as they are. After you press the Start button, a spider will go through your site and will extract all the links to the pages you have. Note the number of links collected, if it is lower than you expected, you should check your site’s linking structure. 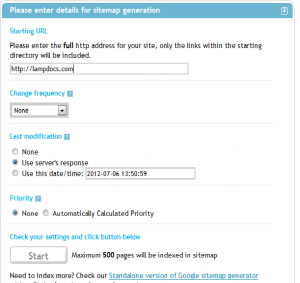 After your sitemap is done, make sure to upload it to the right directory on your server. You should refer to Google guidelines to make this correct.